For other uses, see Begging (disambiguation). "Beggar" redirects here. It is not to be confused with Begga or Bega (disambiguation). Begging (also panhandling or mendicancy) is the practice of imploring others to grant a favor, often a gift of money, with little or no expectation of reciprocation. A person doing such is called a beggar, panhandler, or mendicant. Street beggars may be found in public places such as transport routes, urban parks, and near busy markets. Besides money, they may also ask for food, drink, cigarettes or other small items. Internet begging is the modern practice of asking people to give money to others over the internet, rather than in person. Internet begging is usually targeted at people who are acquainted with the beggar, but it may be advertised to strangers. Internet begging encompasses requests for help meeting basic needs such as food, clothing, and shelter, as well as requests for people to pay for vacations, school trips, and other things that the beggar wants but can't comfortably afford. Beggars have existed in human society since before the dawn of recorded history. Street begging has happened in most societies around the world, though its prevalence and exact form vary. Ancient Greeks distinguished between the penes (Greek: ποινής, "active poor") and the ptochos (Greek: πτωχός, "passive poor"). The penes was somebody with a job, only not enough to make a living, while the ptochos depended on others entirely. The working poor were accorded a higher social status. The New Testament contains several references to Jesus' status as the savior of the ptochos, usually translated as "the poor", considered the most wretched portion of society. A Caveat or Warning for Common Cursitors, vulgarly called vagabonds, was first published in 1566 by Thomas Harman. From early modern England, another example is Robert Greene in his coney-catching pamphlets, the titles of which included "The Defence of Conny-catching," in which he argued there were worse crimes to be found among "reputable" people. The Beggar's Opera is a ballad opera in three acts written in 1728 by John Gay. The Life and Adventures of Bampfylde Moore Carew was first published in 1745. There are similar writers for many European countries in the early modern period. According to Jackson J. Spielvogel, "Poverty was a highly visible problem in the eighteenth century, both in cities and in the countryside... Beggars in Bologna were estimated at 25 percent of the population; in Mainz, figures indicate that 30 percent of the people were beggars or prostitutes... In France and Britain by the end of the century, an estimated 10 percent of the people depended on charity or begging for their food." The British Poor Laws, dating from the Renaissance, placed various restrictions on begging. At various times, begging was restricted to the disabled. This system developed into the workhouse, a state-operated institution where those unable to obtain other employment were forced to work in often grim conditions in exchange for a small amount of food. The welfare state of the 20th century greatly reduced the number of beggars by directly providing for the basic necessities of the poor from state funds. Begging is an age old social phenomenon in India. In the medieval and earlier times begging was considered to be an acceptable occupation which was embraced within the traditional social structure. This system of begging and alms-giving to mendicants and the poor is still widely practiced in India, with over 400,000 beggars in 2015. In contemporary India, beggars are often stigmatized as undeserving. People often believe that beggars are not destitute and instead call them professional beggars. [vague][better source needed] There is a wide perception of begging scams. This view is refuted by grassroots research organizations such as Aashray Adhikar Abhiyan, which claim that beggars and other homeless people are overwhelmingly destitute and vulnerable. Their studies indicate that 99 percent men and 97 percent women resort to beggary due to abject poverty, distress migration from rural villages and the unavailability of employment. 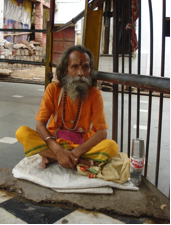 Many religions have prescribed begging as the only acceptable means of support for certain classes of adherents, including Hinduism, Sufism, Buddhism, and typically to provide a way for certain adherents to focus exclusively on spiritual development without the possibility of becoming caught up in worldly affairs. Religious ideals of ‘Bhiksha’ in Hinduism ,‘Charity’ in Christianity besides others promote alms-giving. This obligation of making gifts to God by alms-giving explains the occurrence of generous donations outside religious sites like temples and mosques to mendicants begging in the name of God. Tzedakah plays a central role in Judaism. According to the Torah, Jews are obligated to contribute 10% of their income as tithes, which also can include giving to the poor. In Buddhism, monks and nuns traditionally live by begging for alms, as done by the historical Gautama Buddha himself. This is, among other reasons, so that Laity can gain religious merit by giving food, medicines, and other essential items to the monks. The monks seldom need to plead for food; in villages and towns throughout modern Myanmar, Thailand, Cambodia, Vietnam, and other Buddhist countries, householders can often be found at dawn every morning streaming down the road to the local temple to give food to the monks. In East Asia, monks and nuns were expected to farm or work for returns to feed themselves. Ming China was founded by former beggar Zhu Yuanzhang. Orphaned in childhood due to famine, Zhu Yuanzhang, turned to the Huangjue temple for help. When the temple ran out of resources to support its occupants he became a mendicant monk traveling China begging for food. Begging has been restricted or prohibited at various times and for various reasons, typically revolving around a desire to preserve public order or to induce people to work rather than to beg for economic or moral reasons. Various European poor laws prohibited or regulated begging from the Renaissance to modern times, with varying levels of effectiveness and enforcement. Similar laws were adopted by many developing countries such as India. "Aggressive panhandling" has been specifically prohibited by law in various jurisdictions in the United States and Canada, typically defined as persistent or intimidating begging. Each State and Territory has individual laws regarding begging and panhandling. There is no nationwide ban but it is illegal in several federal states. The province of Ontario introduced its Safe Streets Act in 1999 to restrict specific kinds of begging, particularly certain narrowly defined cases of "aggressive" or abusive begging. In 2001 this law survived a court challenge under the Canadian Charter of Rights and Freedoms. The law was further upheld by the Court of Appeal for Ontario in January 2007. British Columbia enacted its own Safe Streets Act in 2004 which resembles the Ontario law. There are also critics in that province who oppose such laws. Forcing others to beg, repeatedly tangling or using other means of nuisance. Those cases are violations of the Article 41 of the Public Security Administration Punishment Law of the People's Republic of China. For the first case, offenders would receive a detention between 10 days and 15 days, with an additional fine under RMB 1,000; for the second case, it is punishable by a 5-day detention or warning. According to Article 262(2) or the Criminal Law of the People's Republic of China, organizing disabled or children under 14 to beg is illegal and will be punished by up to 7 years in prison, and fined. After the establishment of the Ming Dynasty many farmers and unemployed laborers in Beijing were forced to beg to survive. Begging was especially difficult during Ming times due to high taxes that limited the disposable income of most individuals. Beijing's harsh winters were a difficult challenge for beggars. To avoid freezing to death, some beggars paid porters one copper coin to sleep in their warehouse for the night. Others turned to burying themselves in manure and eating arsenic to avoid the pain of the cold. Thousands of beggars died of poison and exposure to the elements every year. Begging was some people's primary occupation. A Qing Dynasty source describes that "professional beggars" were not considered to be destitute, and as such were not allowed to receive government relief, such as food rations, clothing, and shelter. Beggars would often perform or train animals to perform to earn coins from passerby. Although beggars were of low status in Ming, they were considered to have higher social standing over prostitutes, entertainers, runners, and soldiers. Some individuals capitalized on beggars and became "Beggar Chiefs". Beggar chiefs provided security in the form of food for beggars and in return received a portion of beggars daily earnings as tribute. Beggar chiefs would often lend out their surplus income back to beggars and charge interest, furthering their subjects dependence on them to the point of near slavery. Although beggar chiefs could acquire significant wealth they were still looked upon as low class citizens. The title of beggar chief was often passed through family line and could stick with an individual through occupational changes. Begging in Denmark is illegal under section 197 of the penal code. Begging or letting a member of your household under 18 beg is illegal after being warned by the police and is punishable by 6 months in jail. Begging has been legal in Finland since 1987 when the poor law was invalidated. In 2003, the Public Order Act replaced any local government rules and completely decriminalized begging. A law against begging ended in 1994 but begging with aggressive animals or children is still outlawed. A woman begging at traffic lights in Patras, Greece. Hungary has a nationwide ban. This may include stricter related laws in cities such as Budapest, which prohibits picking things from rubbish bins. Begging is criminalized in cities such as Mumbai and Delhi as per the Bombay Prevention of Begging Act, BPBA (1959). Under this law, officials of the Social Welfare Department assisted by the police, conduct raids to pick up beggars who they then try in special courts called ‘beggar courts’. If convicted, they are sent to certified institutions called ‘beggar homes’ also known as ‘Sewa Kutir’ for a period ranging from one to ten years for detention, training and employment. The government of Delhi, besides criminalizing alms-seeking has also criminalized alms-giving on traffic signals to reduce the ‘nuisance’ of begging and ensure the smooth flow of traffic. Aashray Adhikar Abhiyan and People's Union of Civil Liberties, PUCL have critiqued this Act and advocated for its repeal. Section 2(1) of the BPBA broadly defines ‘beggars’ as those individuals who directly solicit alms as well as those who have no visible means of subsistence and are found wandering around as beggars. Therefore, during the implementation of this law the homeless are often mistaken as beggars. Beggar homes, which are meant to provide vocational training, have been often found to have abysmal living conditions. Begging with children or animals is forbidden but the law is not enforced. Buddhist monks appear in public when begging for alms. Although homelessness in Japan is common, such people rarely beg. Begging in Luxembourg is legal except when it is indulged in as a group or the beggar is a part of an organised effort. According to Chachipe a Roma rights advocacy NGO 1639 begging cases were reported by Luxembourgian law enforcement authorities. Roma beggars were arrested, handcuffed, taken to police stations and held for hours and had their money confiscated. Begging is banned in some counties and there were plans for a nationwide ban in 2015, however this was dropped after the Centre Party withdrew their support. Begging is prohibited in the Philippines under the Anti-Mendicancy Law of 1978 although this is not strictly enforced. In Portugal, panhandlers normally beg in front of Catholic churches, at traffic lights or on special places in Lisbon or Oporto downtowns. Begging is not illegal in Portugal. Many social and religious institutions support homeless people and panhandlers and the Portuguese Social Security normally gives them a survival monetary subsidy. Law 61 of 1991 forbids the persistent call for the mercy of the public, by a person who is able to work. US State Department Human Rights reports note a pattern of Roma children registered for "vagrancy and begging". Begging is illegal under the Vagrancy Act of 1824. However it does not carry a jail sentence and is not well enforced in many cities, although since the Act applies in all public places it is enforced more frequently on public transport. Local authorities may issue public space protection orders for particular areas which makes begging subject to a fine. In parts of San Francisco, California, aggressive panhandling is prohibited. In May 2010, police in the city of Boston started cracking down on panhandling in the streets in downtown, and were conducting an educational outreach to residents advising them not to give to panhandlers. The Boston police distinguished active solicitation, or aggressive panhandling, versus passive panhandling of which an example is opening doors at a store with a cup in hand but saying nothing. U. S. Courts have repeatedly ruled that begging is protected by the First Amendment's free speech provisions. On August 14, 2013, the U. S. Court of Appeals struck down a Grand Rapids, Michigan anti-begging law on free speech grounds. An Arcata, California law banning panhandling within twenty feet of stores was struck down on similar grounds in 2012. A beggar in Denver, USA in 2018. A 2002 study of 54 panhandlers in Toronto reported that of a median monthly income of $638 Canadian dollars (CAD), those interviewed spent a median of $200 CAD on food and $192 CAD on alcohol, tobacco and illegal drugs, according to Income and spending patterns among panhandlers, by Rohit Bose and Stephen W. Hwang. The Fraser Institute criticized this study, citing problems with potential exclusion of lucrative forms of begging and the unreliability of reports from the panhandlers who were polled in the Bose/Hwang study. In North America, panhandling money is widely reported to support substance abuse and other addictions. For example, outreach workers in downtown Winnipeg, Manitoba, Canada, surveyed that city's panhandling community and determined that approximately three-quarters use some of the donated money to buy tobacco products, while two-thirds buy solvents or alcohol. In Midtown Manhattan, one outreach worker anecdotally commented to the New York Times that substance abuse accounts for 90 percent of panhandling funds. This, too, may not be representative since outreach workers work with those with abuse problems. Because of concerns that people begging on the street may use the money to support alcohol or drug abuse, some advise those wishing to give to beggars to give gift cards or vouchers for food or services, and not cash. Some shelters also offer business cards with information on the shelter's location and services, which can be given in lieu of cash. This has been criticised since there are typically far fewer shelter beds than people in need. "The Man with the Twisted Lip", illustrated by Sidney Paget, a beggar playing a major role in a Sherlock Holmes adventure. ^ Cavallo, Guglielmo (1997). The Byzantines. Chicago, Illinois: University of Chicago Press. p. 15. ISBN 978-0-226-09792-3. ^ Pande, B.B (1983). "The Administration of Beggary Prevention Laws in India: a legal aid viewpoint". 11. International Journal of the Sociology of Law: 291–304. ^ "Over 4 Lakh Beggars in India, West Bengal Tops the List Among States". ^ "6 Professional Beggars In India Who Are Probably Richer Than You & I". 2015-07-25. ^ "India Beggars and Begging Scams: What You Should Know". ^ a b AAA, Ashray Adhikar Abhiyan (2006). People Without A Nation: the destituted people; A documented outcome of the national consultation on Urban Poor: Special Focus on Beggary and Vagrancy Laws- the issue of De-custodialisation (De-criminalization). Print-O-Graph, New Delhi. p. 8. ^ Gopalakrishnan, A. (2002). "Poverty As Crime". Frontline Magazine. 19: 23. ^ "農禪vs商禪" (in Chinese). Blog.udn.com. 2009-08-19. Retrieved 2011-12-05. ^ "僧俗". 2007.tibetmagazine.net. Archived from the original on 2012-03-18. Retrieved 2011-12-05. ^ "鐵鞋踏破心無礙 濁汗成泥意志堅——記山東博山正覺寺仁達法師". Hkbuddhist.org. Retrieved 2011-12-05. ^ Hung, Hing Ming (2016). From the Mongols to the Ming Dynasty : How a Begging Monk Became Emperor of China, Zhu Yuan Zhang. New York: Algora Publishing. pp. 21–22. ISBN 9781628941524. ^ Johnny Johnson (November 3, 2008). "In tough times, panhandling may increase in Oklahoma City". The Oklahoman. ^ "Summary Offences Act 1953 - Sect. 12". South Australian Government. Australia. Retrieved 2018-07-27. ^ a b c d e f g "(swedish) I Haag stoppade man tiggarna med förbud". Sveriges Television. ^ "Safe Streets Act". Government of Ontario. 1999. Archived from the original on 2006-09-02. Retrieved 2006-09-29. ^ "'Squeegee kids' law upheld in Ontario". CBC News. 2001-08-03. Retrieved 2006-09-29. ^ "Squeegee panhandling washed out by Ontario Appeal Court". CBC News. 2007-01-17. Retrieved 2007-03-19. ^ "Police chief welcomes Safe Streets Act". CBC News. 2004-10-26. Archived from the original on 2007-05-10. Retrieved 2006-09-29. ^ a b Cass, Victoria (1999). Dangerous Women: Warriors, Grannies, and Geishas of the Ming. New York: Rowman & Littlefield Publishers. p. 7. ISBN 0-8476-9395-3. ^ a b Powers, Martin (2019). China and England: The Preindustrial Struggle for Justice in Word and Image. New York: Routledge. p. 175. ISBN 978-1138504035. ^ Liu-Hung, Huang (1984). A Complete Book Concerning Happiness and Benevolence: A Manual for Local Magistrates in Seventeenth-Century China. Translated by Djang, Chu. Arizona: The University of Arizona Press. p. 554. ISBN 0-8165-0820-8. ^ a b Feng, Menglong (2000). Feng. Translated by Shuhui, Yang; Yunqin, Yang. Seattle: University of Washington Press. pp. 478–480. ISBN 0-295-97843-0. ^ "Straffeloven kap. 22" (in Danish). Archived from the original on 2014-11-09. Retrieved 2014-11-09. ^ "Authorities powerless to act against beggars with children in tow". Helsingin Sanomat. ^ "The Bombay Prevention of Begging Act, 1959" (PDF). ^ a b "Criminalizing Poverty". ^ "The Zen - Teaching of Mu". Japan National Tourist Organisation. Retrieved 2008-07-27. ^ Groth, Annette (2012-06-01). "The situation of Roma in Europe: movement and migration" (PDF). Council of Europe: Committee on Migration, Refugees and Displaced Persons. Archived from the original (PDF) on 5 June 2014. Retrieved 14 April 2013. ^ Borromeo, Rene (16 December 2013). "Should you give to beggars? Cebu City's Anti-Mendicancy Campaign" (in Cebuano and English). Cebu: The Freeman. Retrieved 15 April 2015. ^ "Legea nr. 61/1991 (republicata 2011)" (in Romanian). Poliția de Proximitate. Retrieved 2011-12-01. ^ Bureau of Democracy, Human Rights, and Labor (2006-03-08). "Country Reports on Human Rights Practices - 2005 (Romania)". U.S. Department of State. Archived from the original on September 19, 2006. Retrieved 2006-09-29. ^ Bunyan, Nigel (2003-08-22). "Beggar ban may spark nationwide crackdown". The Daily Telegraph. London. Retrieved 2010-04-26. ^ "Huge increase in Public Spaces Protection Order fines". BBC News. 19 April 2019. Retrieved 19 April 2019. ^ Schuler, Melina, "Cops Planning to Combat Panhandling", The Boston Courant, May 14–20 issue, 2010. "Aggressive solicitation is against the law and is defined as an action that is likely to cause a reasonable person to fear harm or to intimidate him or her into compliance, Ivens said. Passive panhandling, like in front of a convenience store, is constitutionally allowed, however, it is a violation of a Boston ordinance to do it within 10 feet [3 m] of an ATM, bank, or check cashing business during hours of operation, [Boston Police Captain Paul] Ivens said." ^ Romney, Lee (September 27, 2012). "Arcata panhandling law mostly struck down by judge: A Humboldt County judge says provisions of the ordinance banning non-aggressive panhandling within 20 feet of stores, intersections, parking lots and bus stops are unconstitutional". Los Angeles Times. Retrieved 26 May 2016. ^ Bose, Rohit & Hwang, Stephen W. (2002-09-03). "Income and spending patterns among panhandlers". 167 (5). Canadian Medical Association Journal. pp. 477–479. PMC 121964. ^ "Begging for Data". Canstats. 3 September 2002. Archived from the original on 20 April 2006. Retrieved 2006-09-29. ^ a b ""Change for the Better" fact sheet" (PDF). Downtown Winnipeg Biz. Archived from the original (PDF) on 2006-08-13. Retrieved 2006-09-29. ^ Tierney, John (1999-12-04). "The Big City; The Handout That's No Help To the Needy". The New York Times. p. B1. Retrieved 2006-09-29. ^ Wahlstedt, Eero. "Evaluation study of the Oxford Begging Initiative". Oxford City Council. Retrieved 2013-10-25. ^ Johnsen & Fitzpatrick, S. & S. (2010). "Revanchist Sanitisation or Coercive Care? The Use of Enforcement to Combat Begging, Street Drinking and Rough Sleeping in England". Urban Studies. 47 (8): 1703–1723. doi:10.1177/0042098009356128. Retrieved November 25, 2013. ^ Hermer, J. (1999). Policing compassion: 'Diverted Giving' on the Winchester High Street. Bristol: The Policy Press. ISBN 978-1861341556. Retrieved 2013-10-25. ^ "Real Change, not Spare Change". Portland Business Alliance. Archived from the original on 13 November 2006. Retrieved 2006-09-30. ^ Dromi, Shai M. (2012). "Penny for your Thoughts: Beggars and the Exercise of Morality in Daily Life". Sociological Forum. 27 (4): 847–871. doi:10.1111/j.1573-7861.2012.01359.x. ^ Peace Studies Program. "Homelessness Contact Cards". George Washington University. Archived from the original on 9 September 2006. Retrieved 2006-09-30. ^ "Begging Bowl - Buddhist Things". ReligionFacts. Archived from the original on 2011-12-05. Retrieved 2011-12-05. Look up begging, spanging, panhandling, or mendicancy in Wiktionary, the free dictionary. Wikivoyage has a travel guide for Begging. Wikisource has the text of the 1911 Encyclopædia Britannica article mendicancy. Selected legal cases on panhandling in the United States, University of Albany Center for Problem Oriented Policing.